I'm super excited to watch the Olympics. I love the swimming, gymnastics, and mostly the Equestrian events , which they put on at weird times because it doesn't make alot of sponsor money. It definitely on my bucket list of things to do someday, actually go to an Olympics. 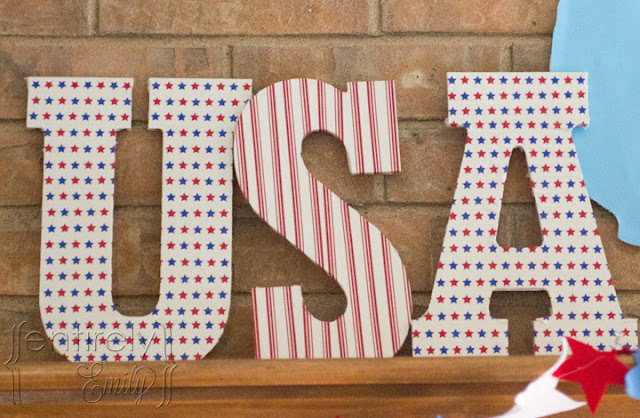 I was all trying to get some decorations made for the fourth of July and had everything bought but I never got to it and I thought to myself, well, it would kinda work for 4th of July/Olympics. So I went ahead and made them. I started off with these wooden "college letters" they were called from Micheals. They were about $3.99 a piece. Normally, that's kinda pricey for me but hey were exactly the size I wanted. 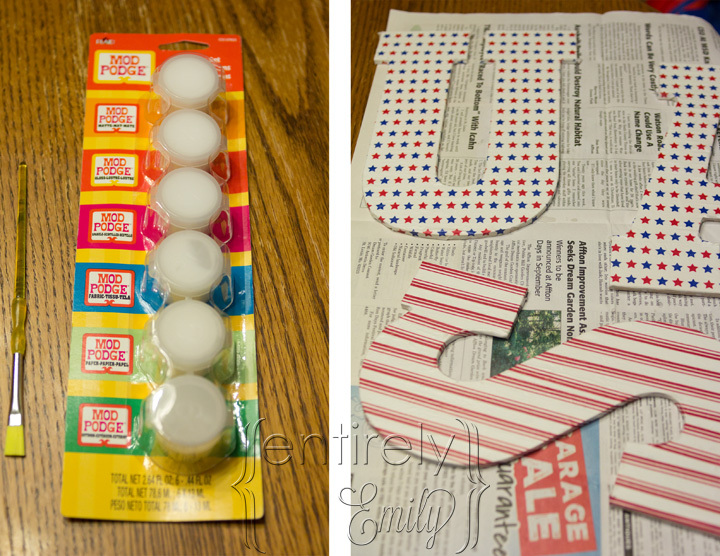 I also found this craft tape on clearance for $2 a piece so I bought two not knowing how much I would need.I started off spray painting the letters white outside. It was 100+ degrees that day so think the paint kinda got baked on which worked to my advantage. Then that night I took the tape and carefully wrapped it around the letters to the edge. I didn't want to waste any tape on the back. Who would see it anyway? Then I bought this Modge Podge sampler pack also at Micheals and went about covering all of the letters with a layer of regular Modge Podge. I can't wait to use the other kinds of Modge. 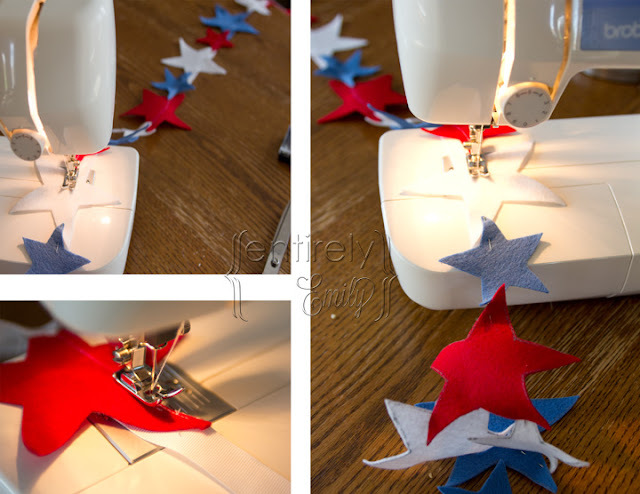 I knew I need something more for my mantle so I saw this awesome post by Amber at Crazy Little Projects for a felt star garland. Lately, I'm all about the garlands and the felt so this was perfect. I went to Hobby Lobby and got three pieces each of red, white and blue felt rectangles, They have every color you can think of and they are 25 cents a piece which sounds like a good price to me. The next day I cut out the stars out of the felt. This took a while let me tell you. Having Amber's templates really helped me out. 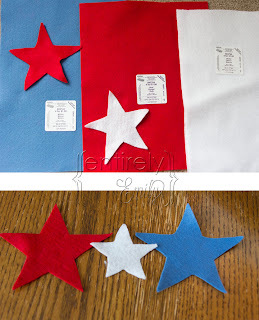 Then I took the star and pinned them in the order I wanted, got out the sewing machine and started to sew them in a line. Being that I am a sewing novice, the star and the line across them is far from perfect but I really liked it. Keep in mind the color of thread you use will be seen across all of the stars. I liked the way the white thread looked. I capped both ends off with a little grosgrain white ribbon I had left over. That also didn't seem like enough. I wanted something to go along with the whole USA theme. I had an idea for a USA map that was just the shape of the country . I found some blue poster board and a piece of foam core. My godmother had this awesomely ancient school projector that she let me have to help decorate S's room. Isn't it kinda cool and funky? All you have to do is place anything , B&W or color in the drawer and slide it in and ta-da... there it is on the wall. I put in my map, traced it backwards ( so wouldn't draw on the front side) and i was done. It was so much easier than free handing it. 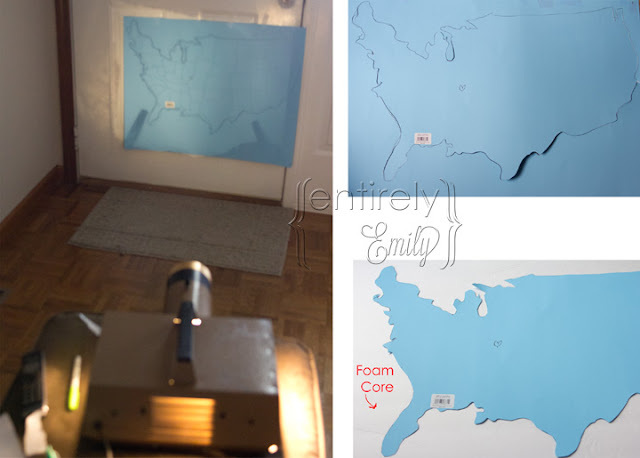 I cut out the map and then cut out the same outline on the piece of foam core. They were glued together. The clear glue didn't work as well as I hoped. Don't use that! 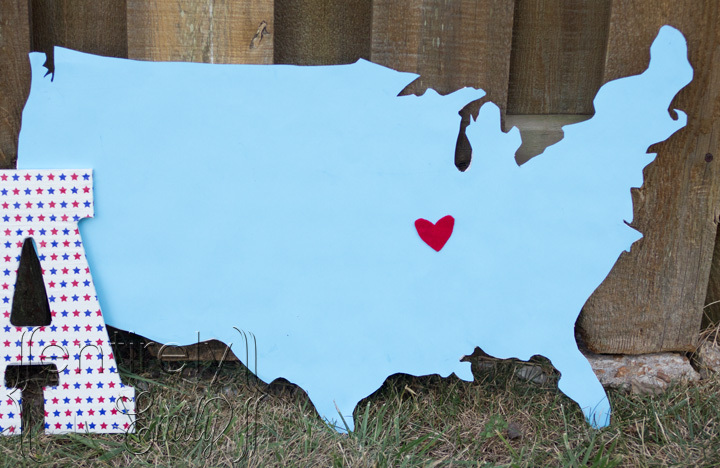 I would say a spray adhesive.I added a felt red heart over Saint Louis for our home town, of course. Then everything was added to the mantle. I really like it but I think I still need something else. I feel like ti's still missing something. Hmm..... what else do I need? I kinda liked it with the fence outside too. A white fence would have been awesome. As always I LOVE it. Great idea on the map. I might have to do the garland -- very cute. Thanks. It was super easy and it's going to store so nice and small. Very cute! Love the garland! Aww..thanks Janice. Which are you favorites to watch? Hi - Saw your post over at Debbiedoos. LOVE the cut out of the USA. 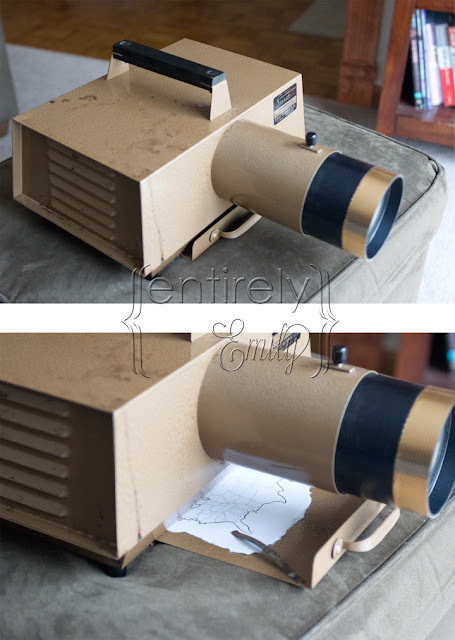 I wish I had a grandma with a cool projector! It really was a great thing to have access to. My godmother has all kinds of cool stuff. Thanks, Katie. I wish I had thought of them for the 4th too. LOL. I already have my jars ready for your project too. These are fantastic decorations! I love the Olympics & I think it's smart to use them as decorations for that. 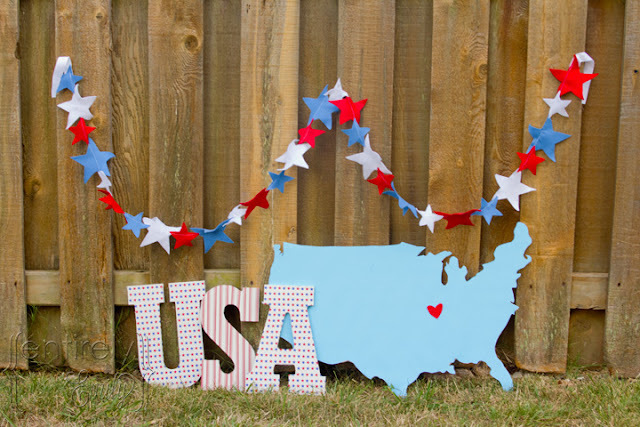 (in addition to the 4th) I really love that USA cutout! Thank You. I always love things that are double duty as I'm not good about always having decor up. I have chosen you for Debbiedoo's Newbie Spotlight of the Week. Come on over tomorrow to see your featured post. Congratulations! Wow...thank you so much. I'm so excited to see it . I'm going to tell all my friends. Just popping over from Random Thoughts to see your post Gina is crazy about and she's right! Your patriotic decorations are fabulous! I especially like the star garland. GO USA! Wow - the decorations look so cute!! 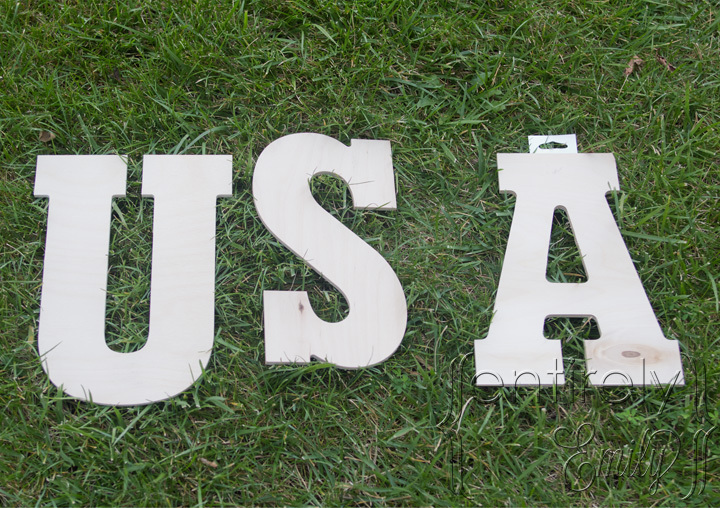 I love the USA the best. Pinning this for sure. I'm glad you linked it up at Romance on a dime! Thanks, Betsy. Thanks for having me. I was just over at Gina's and read about you and your blog and wanted to stop by and say hello. Your 4th of July/Olympics crafts are great. Go USA! 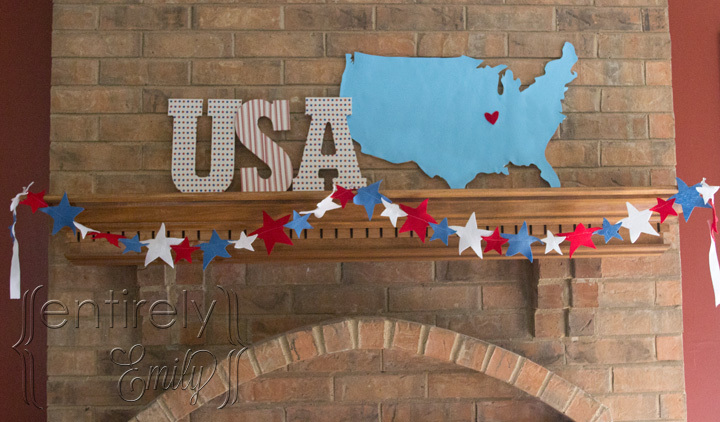 Never thought about decorating for the Olympics but I love the idea! Great way to show your support. Love it! Hi, Ana. Glad to have you, Thanks. Hi Alisha. So nice to meet you and I'm following you right back. But can I really like you, Your a Yankees fan :) LOL ? Thanks, Amie. I will do that. Awesome. Love it! We are huge Olympic fans...makes me want to run out and make it all. It looks so festive and fun! Thank you so much. Go for it! Love this idea! We would love to have you link up some of your projects at our party! Oh my gosh I love them all!!! Stopping by from My turn for us to follow your creativity here. If you're up for a ride I'd love it if you'd join me at localsugarhawaii.com where we're riding the wave of life, one little adventure at a time. Oooh, ooh, ooh and this and every Friday we host the ALOHA Friday HOP where the sweetest of bloggers link up and help each other to grow, grow, grow... come join us if you please. Thanks, Nicole. I'm already there. What a great way to support the United States Olympic contestants. I love the letters and the stars and the map is so awesome. Ok, I guess I just love it all. As far as what you are missing, maybe the Olympic rings?? What a fun item to have, an old projector, your possibilities are endless with that:) Thanks you so very much for sharing at Freedom Fridays. Thanks, Evelyn. yes, that projector comes in very handy. I'll see you Friday! Thanks. I'm not sure it's about the decor or not. I saw some of your athletes and some of those guys are so cute!